In comparison to modern farming techniques practised in Western civilisations, the key elements of permaculture are low energy and high diversity inputs. The design of the landscape, whether on a suburban block or a large farm, is based on these elements. Develop the fundamentals to implement permaculture principles. 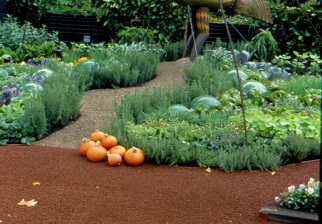 Learn to design a permaculture garden. Learn about natural settings, zones and sector planning. Qualify for a Permaculture Design Certificate (PDC). Permaculture seeks to increase sustainability and biodiversity, lessen input, grow plants that have more than one use and that are actually used rather than just grown. Many plants will perform these functions. Plants that are grown as culinary herbs can have medicinal qualities, trees that bear nuts and fruit feed people and animals, provide windbreaks, animal shelters and alter microclimates. Some provide fodder for animals, fix nitrogen in the soil, provide mulch, are beneficial companions to other plants, improve the soil and attract insects. Others provide wood for fuel and timber for buildings and fences. Completion of this course will help you to develop your ability to independently prepare plans for a permaculture system appropriate for particular environments and sites. Learn about the different growing methods which underpin permaculture, natural systems which constitute ecology i.e. the relationships between water, soils, plants and animals, zonal planning in permaculture systems and how plants, animals, fish and other components fit in. The course culminates in designing a permaculture system and preparing drawings. Tutors in this course hold an authentic PDC. ACS is a Member of the Permaculture Association (UK), The Institute of Horticulture (UK), and the Alternative Technology Association (Australia). Permaculture is a philosophy which encompasses the establishment of environments which are highly productive, stable and harmonious and which provide food, shelter, energy etc., as well as supportive social and economic infrastructures. It involves developing a garden or farm where the plants and animals are put together in such a way that they support each other's growth and development. The garden or farm may very well change over the years, but it always remains productive, requires little input once established, and is environmentally sound. This course was developed to encompass and go beyond the curriculum of the Permaculture Design Certificate, as set down by the Permaculture Institute. To obtain the PDC, the permaculture tutor must be satisfied of your knowledge and understanding of permaculture. To that end, we require that students wanting to achieve the PDC take the ACS DE exam at the end of the permaculture systems. Start Date: Start studying the Permaculture Systems course at any time - study at a pace that suits you, and with full tutor support for the duration of your studies. Permaculture principles and ethics, Principles of Design (Relative location, Multiple Functions, Multiple Elements, Elevational Planning, Biological Resources, Energy Recycling, Natural Selection, Maximise Edges, Diversity); Permaculture Relationships to other Systems, Sustainable Agriculture, Organic Growing, No Dig Gardening, Sheet Composting, No Till Planting, No Dig Raised Beds, Crop Rotation, Cover Cropping, Composting, Companion Planting, Pest and Disease Prevention, Biological Control. The Ecosystem (Abiotic and Biotic components), Ecological Concepts, Biomass, Climate, Microclimates, Water, Water and Plant Growth, Maximising Plant Water, Arid Landscapes, Irrigation, Swales, Waste Water Treatments, Reed Beds, Aquatic Environments, The Hydrological Cycle, Rainfall, Evaporation, Infiltration, Effective Rain, Soil Environments (Microorganisms, Organic Matter, Soil Degradation and rehabilitation, Erosion, Salinity, Acidification), Managing Wildlife in a Permaculture System, Structure, Structure of a Permaculture System, Stacking, Successions. Five Standard Zones, Sectors (sun, Cold, Windy etc. ), Site selection, Pre-planning information, Staged procedure for concept design. Forests and trees, Trees as energy transducers, Forest types (Fuel, Forage, Shelterbelt, Animal barrier, Structural, Conservation), Establishing a forest, Sector/Zone Analysis, Firebreak, Windbreak, Mandala Gardens, Keyhole beds, Water bodies, Pond design, Pond construction. Locating animals in a system, Function of animals in Permaculture, Bees, Poultry, Mobile Tractor Systems, Pigs, Grazing animals, Fencing, Water supply, Shelter, Birds, Earthworms, Aquaculture. Vegetable Growing Hints, Soil Management for plants, Organic fertilizers, Animal manures, Liquid feeds, Rock dusts, Legumes (Nitrogen fixing), Mycorrhyzae, Mulch, Weed Management, Pest Control, Culture of a large range of plants suited to permaculture, in different environments (including: Asparagus, Black locust, Cassava, Chicory, Dandelion, Endive, Fennel, Garlic, Ginger, Horseradish, Leek, Mint, Okra, Pigface, Rhubarb, Sweet Potato, Taro, Warrigal Greens, Water Cress, Water Spinach, Yam, Apple, Apricot, Cherry, Citrus, Fig, Loquat, Nashi Pear, Olive, Peach, Pear, Plum, Quince, Avocado, Banana, Carambola, Coconut, Custard Apple, Guava, Mango, Paw Paw, Pepino, Pineapple, Grape, Passionfruit, Kiwi fruit, Strawberry, Raspberry, Currant, Gooseberry, Mulberry, Blueberry, Brambles, Elderberry, Cranberry, Nuts, Fodder Trees, etc.). For example; Solar energy, Wind Energy, Methane, Bio fuel power, Composting Toilets, Energy efficient housing, Living fences (hedges, hedgerows etc), Water recycling (grey water and constructed wetland). Several plans will be prepared by the student, including one major design. This is an ideal starting point for anyone who already has professional training in a related field such as agriculture or horticulture. Explain the principles of permaculture. Explain the concepts of natural systems. Explain permaculture techniques involving zones and sector planning. Explain a range of permaculture techniques: (forest plantings, mandala gardens, ponds etc.). Explain the significance of different animals in a permaculture system. Select plants appropriate for inclusion in a permaculture system, to supply a useful and sustained harvest; explain their husbandry. Draw permaculture designs (plans) to scale. Explain three different cultural techniques used to minimise the maintenance requirement in permaculture systems you study. Evaluate the use of technology in a house (you choose the house). Permaculture is a system of agriculture based on perennial, and self‑perpetuating, multi-use plants and animal species which are useful to man. In a broader context, permaculture is a philosophy which encompasses the establishment of environments which are highly productive, stable and harmonious and which provide food, shelter, energy etc., as well as supportive social and economic infrastructures. Permaculture copies patterns from nature, it focuses on the way elements are placed in the landscape and in the way they inter-relate, rather then on the individual elements. Other then food production, permaculture encompasses the use of appropriate technology e.g. energy efficient buildings, recycling, waste water treatment, solar and wind energy and composting toilets. In comparison to modern farming techniques practiced in Western Civilisation, the key elements of permaculture are low energy and high diversity inputs. The design of the landscape, whether on a suburban block or a large farm, is based on these elements. Permaculture is an ethical approach to designing land use and community systems, to provide food, ecological habitats and other essentials needed for human survival. The term 'permaculture' comes from the words 'PERMAnent' and 'agriCULTURE', and implies the permanence of culture. The term was first devised in 1978 by Bill Mollison (an Australian ecologist) and his student David Holmgren. "Care of the Earth" - this includes all living things and non living things which together comprise the environment (i.e.. animals, plants, land, water and air). "Care of People" - permaculture systems should be developed to promote self reliance and community responsibility. "Fair Share" - set limits to consumption and reproduction, and redistribute surplus - pass on anything surplus to an individual's needs (e.g. labour, information or money) in an attempt to pursue the above aims. Implicit in the above is the 'Life Ethic': all living organisms are not only means, but ends. In addition to their instrumental value to humans and other living organisms, they have an intrinsic worth. As such permaculture stresses a positive approach and an attitude of cooperation, with respect to the environment and all living things. Permaculture copies patterns from nature, it focuses on the way elements are placed in the landscape and in the way they inter-relate, rather than on the individual elements. Some graduates use this course as a foundation for developing their own property, becoming more self sufficient and ecologically friendly in how they live. The foundation they develop in this course forms a basis for ongoing, life long learning. They may get involved with a Permaculture Association or Community garden, read books, visit field days and exhibitions, and experiment on their own property - continually building their knowledge and improving their land. Environmental consultant, who has a capacity to advise on permaculture along with other aspects of environmental management. The possibilities for employment are endless. A knowledge of permaculture can enhance and expand your career prospects across a very wide range of jobs. You can start the Permaculture Systems course at any time. Develop the fundamentals required to implement permaculture principles, and to produce a design for a large or small property. Develop your own property - become more self-sufficient. Use this a basis for a career move - including becoming a garden designer or an environmental consultant. You can interact one to one with a professional tutor with decades of experience - just email, phone or log on to chat to connect with them. You can enrol right now - just go to the "It's easy to enrol" box at the top of this page. Use our FREE COURSE COUNSELLING SERVICE. If you want to learn about a more self-sufficient and more environmentally attuned lifestyle then this course is an ideal place to start. Study in your own home and learn more about permaculture and a more sustainable approach to living. Why delay? Get started today! Commercial Hydroponics The Commercial Hydroponics ebook is ideal for students, professional horticulturalists and those who want to build a strong foundation knowledge in hydroponics. The commercial hydroponics ebook explains how to set up a commercial hydroponics system, including growing techniques and equipment that you will need. The topics covered in this book include an introduction to hydroponics, site considerations, alternatives, plant nutrition, nutrient film technique culture, rockwool culture, aggregate culture, other techniques, hydroponics equipment, greenhouse operation, plant culture in hydroponics, Vegetable crops, berry and other fruit crops, flower crops, other crops, managing a commercial hydroponic farm and a troubleshooting guide. Weeds This book helps you understand different types of weeds, and how to control them. Many of the more commonly occurring weeds around the world are both illustrated and described. What to Plant Where A great guide for choosing the right plant for a particular position in the garden. Thirteen chapters cover: plant selection, establishment, problems, and plants for wet areas. Shade, hedges and screens, dry gardens, coastal areas, small gardens, trees and shrubs, lawns and garden art.